An essential ingredient for Thai dishes, many people in Thailand put this on almost everything. We are currently shipping this in a strong ziplock as shown. You get 40 grams, which is about 5 tablespoons. Use generously to add flavor and a unique fragrance. 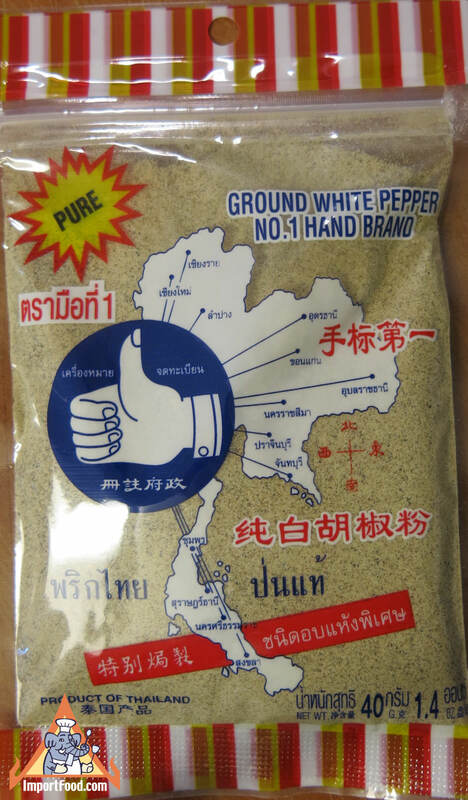 This is a pure, all-natural, finely ground white pepper made at the highest standards from only the very best whole Thai peppercorn. Thai peppercorn is a special variety, distince from other white peppercorns found in neighboring countries. This product adds fragrant aroma, and the white pepper is a gentle spice that does not overwhelm the food. Hand Brand Prik Thai has the prestigious Shell Shuan Shim award. Typically added to fried rice, soup, any any other Thai foods you prefer. Pounded together with coriander seed powder and garlic, is called a natural "Thai MSG" by the Prime Minister of Thailand, and can be used in just about every Thai dish. Below are many authentic Thai recipes from our recipe section that call for Thai pepper powder. For something unique try it in Thai-style sundried beef jerky. We also recommend you try our galanga powder or lemongrass powder of the same brand.